The Magdalen Reading. Rogier van der Weyden. By permission of the National Gallery, London. 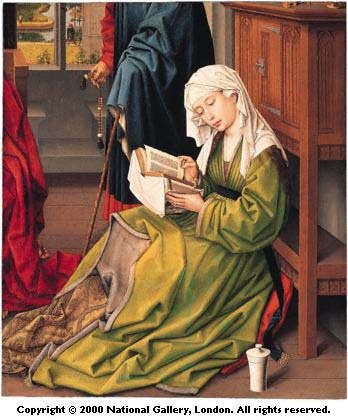 This painting by the Flemish artist Rogier Van der Weyden (1400-64) illustrates the way that the earlier Northern schools of art followed the Italian Renaissance masters; his sensitivity of colour and line, and the idealized portrait of Mary of Magdala align him with such artists as Botticelli.